The original concrete floor had to be lowered to create the required height; the new floor has been gravelled. 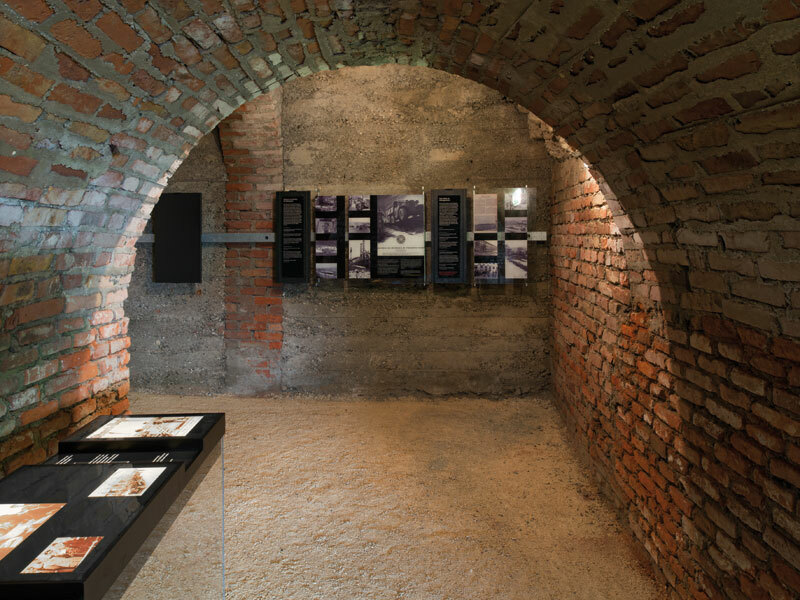 Austrian exhibition and interior architecture practice, Bernhard Denkinger Architekt, has transformed a 140m-long U-shaped underground tunnel system - a Second World War civilian air-raid shelter - into an exhibition space for artefacts collected from former inmates of the Steyr-Münichholz Concentration Camp. 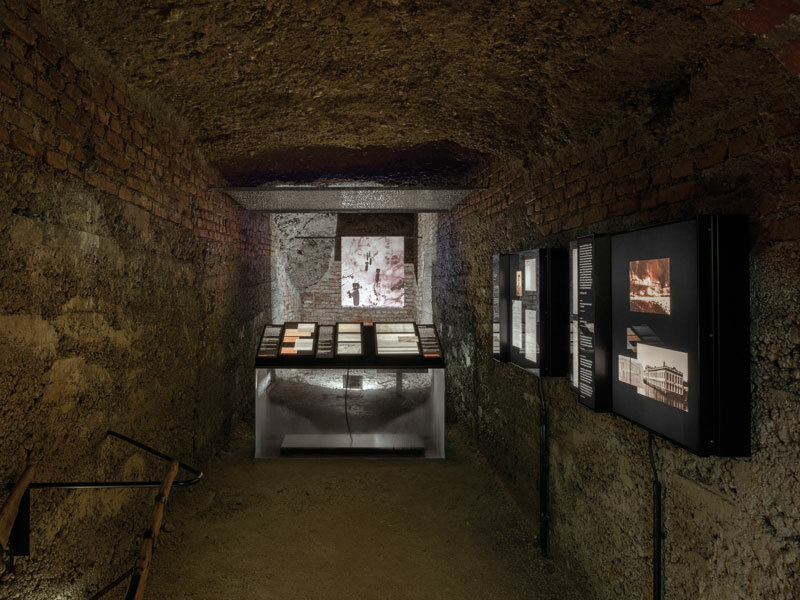 The Steyr Concentration Camp committee, Mauthausen Komitee Steyr, had gathered the exhibition's artefacts for more than 10 years after forging relationships with organisations for the former inmates. 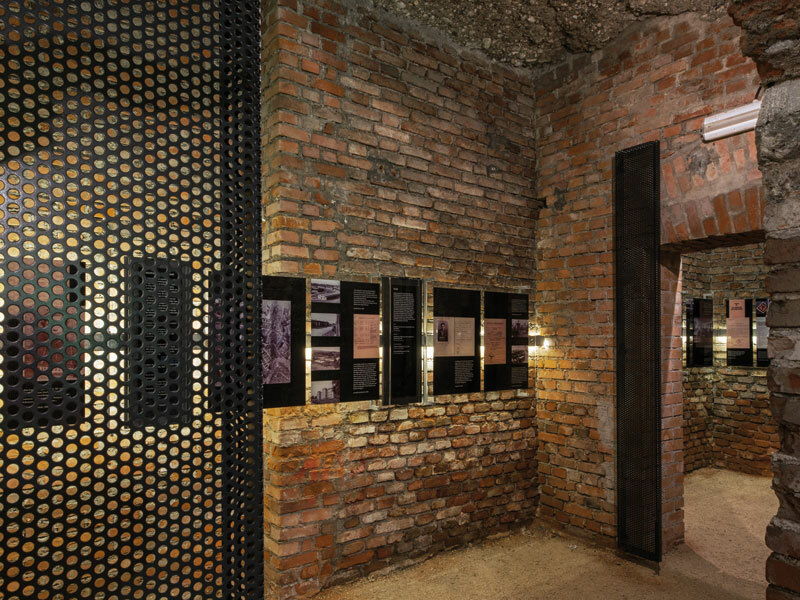 'The client's prior interest was to see the remembrances and artefacts of the former inmates put on show,' explains architect Bernhard Denkinger, of Bernhard Denkinger Architekt, adding that the client was reluctant to see the exhibition curator's suggestion of a storyboard highlighting historical circumstances and developments. 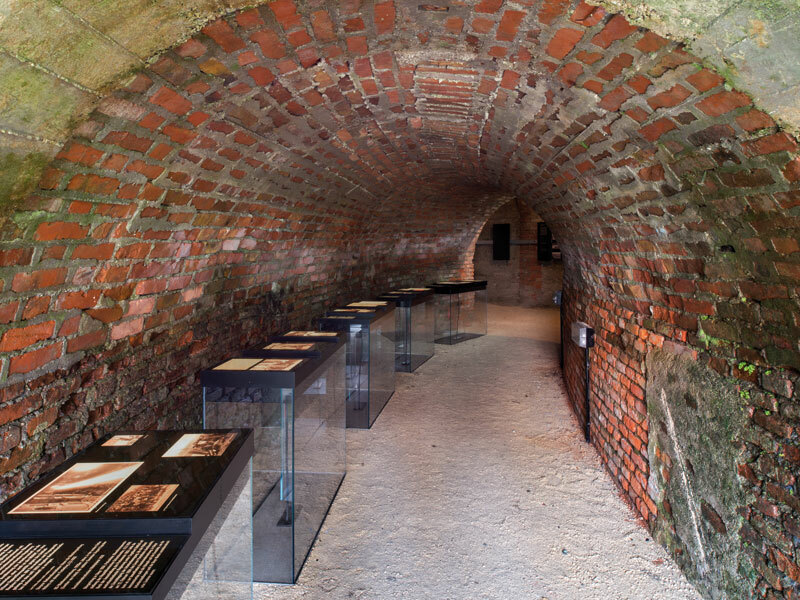 The tunnel, which has been left in its original character, was built in 1943 by those held in the Steyr-Münichholz concentration camp. Traces of the stone working, created in makeshift brickwork, can be clearly seen on the walls and ceilings. But after the war ended the outer gates of the shelter, the gates of the air locks leading to the inner shelter and all technical installations of the building was dismantled. During the Fifties the tunnel served as storage space. 'We discovered rudimentary electrical installations dating back to this period,' says Denkinger. 'In 2010, when I saw the building for the first time, the floor was devastated by boulders and sand brought in by floods from the nearby Steyr river. In several areas the floor level changed due to layers of concrete of varying thickness, some of them dating to the Fifties.' To achieve a tunnel profile with minimum heights of 2.10m, the floor had to be lowered. Excavating the stone under the existing floor, in some areas by an additional 40cm, provided the building's new floor, which was then covered by compacted white limestone-gravel. 'An important part of the budget had to be invested to make the tunnel system usable for the installation of an exhibition. Existing floor fragments had to be demolished and disposed of,' says Denkinger. Electric installations, emergency and security lighting had also to be provided as part of the design scheme, and protection against the very high humidity in the tunnel system was achieved by using blackcoated metal tubing. The design uses defined spaces - through the creation of breaks, empty areas and interruptions to the flow - to create 'windows of perception' for the important spatial and sensory qualities of the underground structure. It divides the tunnel into contrasting sequences: 'rhythmically structured paths' suggesting movement, more static and contemplative sections, and short 'meditative' passages that invite the visitor to stop, think and reflect. The tunnel is seen as a dark space separated from the outside world. The light that is ushered in carves zones out of the darkness in which the exhibition is presented. The light intensity varies during a visit. The subdued and diffused light of the 'empty stretches', which are just bright enough for the route to be seen, becomes more intense in the exhibition 'stations'. When entering the 'Offenders station', minimalistic representations of the individual offender profiles includes a large-scale colour photograph outside the room. Solid stone pillars under the load-bearing brick belt narrow the exit from the room and emphasise the impression of heaviness and oppression created by the stone ceiling. In the centre of the tunnel the light withdraws into the exhibition installations, turning them into illuminated islands standing out against the darkness. The installations cover approximately 60 per cent of the space in the tunnel. They are divided in 18 light installations, placed individually, and a system of glass panels on tubular supports. 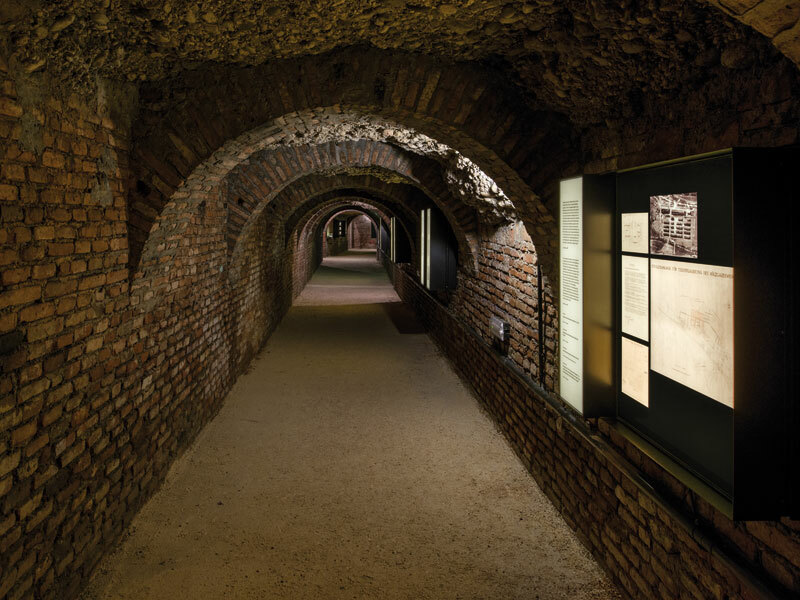 A long corridor containing 10 illuminated installations marks the centre of the exhibition. Here are documents on the building of the Steyr-Münichholz Concentration Camp and on the living conditions of its inmates. Visitors arrive at this central core through a semicircular entrance area, marked by five closely linked and illuminated glass blocks. They lead to an intermediate labyrinthine airlock area. The three-dimensional design of the illuminated elements with set-back parts and niches permits a 'layered' perception, with various levels containing the very diverse and concentrated pictures and documents, accounts and commentaries. When approaching the various stations the impression is of a wealth of pictures and documents or a series of texts that appear to stand out from the other exhibition documentation.